The lot is overgrown, crowded with unruly shrubs, vines, and waist-high weeds. 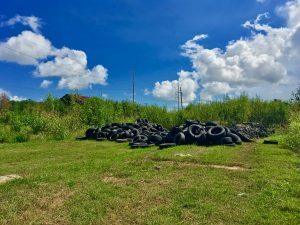 It is littered with old tires and garbage and is now home to a rusted Toyota Tercel. The air is heavy and buzzing with mosquitoes. This is the Lower 9th Ward, where U.S. Forest Service research forester Wayne Zipperer studied the vegetation on abandoned lots after Hurricane Katrina. The Category 3 struck New Orleans in 2005. Vegetation surveys found invasive species like Chinese tallow and golden raintree. Photo by Josh Lewis, Tulane University. More than 228,000 homes in New Orleans were lost due to the flooding. Many residents left the city, and state and municipal land managers have struggled to attract redevelopment and bring residents back to some areas. Abandoned urban land can attract rodents and mosquitoes. Damaged buildings or refuse piles pose safety concerns. These issues can discourage economic reinvestment and recovery. Zipperer and his colleagues looked at the intersection of abandoned land, vegetation regrowth, and community recovery. There’s not a lot of research on urban plant communities and disasters. Would the same trees, shrubs, and grasses return post-Katrina? Would they find more productive, diverse systems? Would they find novel plant communities? The study was led by Josh Lewis, a research assistant professor at Tulane University, and published in Ecosphere. The scientists used three sets of aerial photographs to assess vegetation disturbance. One set of photos was taken in 2004, a year before Katrina. Another set was taken just a month after Katrina, and the third was from 2013. The researchers surveyed 180 plots across eight neighborhoods in New Orleans — four in the Bienvenue Basin, and four outside of the basin. Neighborhoods inside the basin were inundated for close to a month and left with a mat of sediment after the water receded — in some places, almost three feet of sediment. The other neighborhoods included in the study experienced a range of flooding conditions — from none to severe. However, none experienced intense storm surges like in the basin, and sedimentation in these four neighborhoods was localized and minor. On each plot, the team measured tree, shrub, vine, and herbaceous species, including grasses. They gauged how much of the plot was covered by each type of vegetation and recorded different structural attributes of each type. In neighborhoods with minor flooding, there was not much change. Overgrown lots can generate or worsen social stigmas around urban green space. Photo by Josh Lewis, Tulane University. In general, urban forest management tries to increase tree cover, but in this case, more vegetative cover also created problems for residents. The researchers also found that socioeconomic factors were strong predictors of what kinds of vegetation remained or returned after Katrina. Neighborhoods with more African-American residents, greater rates or land abandonment, and lower median household incomes had more invasive species. Non-native, invasive trees were more common in areas with higher proportions of non-white residents. Trees in more affluent, predominantly white neighborhoods were larger. These areas also had a greater diversity of shrubs — and more mulch, an indicator of landscape maintenance or wealth. In neighborhoods outside the basin, the scientists found more ornamental turfgrasses, like Bermuda grass. In the basin, they found more grass species as well as taller grasses. Forbs such as giant ragweed were common, especially in neighborhoods with more state-managed vacant lots. A similar pattern is playing out in Puerto Rico after Hurricane Maria. “Having the ability to do a comparison study would add significantly to our understanding of how cities respond to catastrophic events,” adds Zipperer. The researchers also wanted to understand how different management decisions – particularly on abandoned lots – might have contributed to neighborhood recovery. Lewis is familiar with the social geography of New Orleans — how, where, and why different social groups in the city interact with their environment. He attended local meetings, interviewed residents about housing recovery in the basin and non-basin neighborhoods, and collected data about different recovery programs. The different programs affected the plant communities that returned. 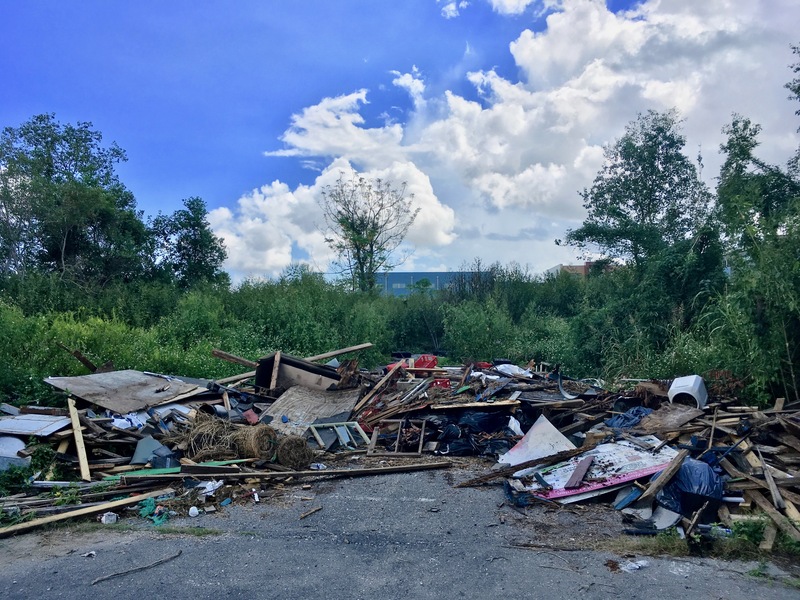 Unmanaged vegetation on abandoned lots can mean unequal benefits and hazards for different neighborhoods and social groups — an environmental justice issue. Photo by Josh Lewis, Tulane University. Recovery and resettlement programs were distributed and implemented unevenly. 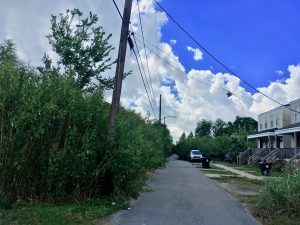 St. Bernard Parish, a predominantly white basin neighborhood, utilized agressive vegetation maintenance and a program called the Lot Next Door. Returning residents were able to purchase abandoned lots adjacent to their own at a reduced cost. Public funds were invested to mow state-owned, as well as some privately owned, vacant lots. The result: fewer opportunistic, invasive plant species and more manicured lawns. Parish officials credit these efforts with attracting redevelopment and stabilizing property values — though St. Bernard Parish has still struggled to regain its pre-storm population. 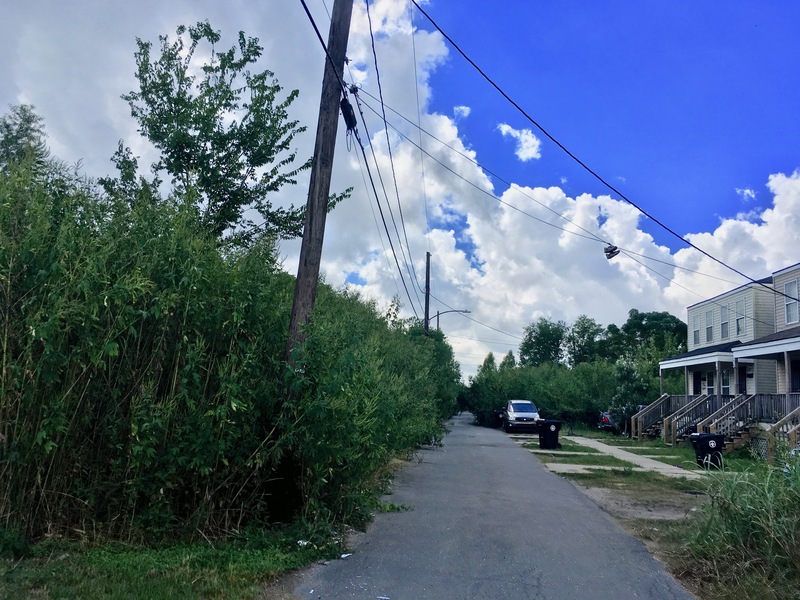 Neighborhoods with high rates of land abandonment in New Orleans instead saw intermittent management and a mosaic of lawnscapes and emergent forest. The lack of landscape management on these abandoned lots added to the recovery challenges remaining residents continue to face. St. Bernard Parish and the Lower 9th Ward are equally susceptible to another flood-triggered catastrophe because of their geography. But public reinvestment in land management after Katrina has been strikingly different. The resulting differences in emergent vegetation, in turn, have affected the trajectory of economic or social recovery in those areas – and reinforced economic, racial, and social disparities. For more information, email Wayne Zipperer at wzipperer@fs.fed.us.